Another major milestone has been reached in the construction of the new Charlesview, with tradespeople gathered for the ironworkers’ Topping Off and a bbq lunch. With beautiful weather, ample progress all over the site, and a construction workforce of over 120, it was a festive afternoon at the jobsite. The tradition has a folk history dating back centuries, is a symbolic moment in construction, when the highest piece of structure is hoisted into place. The ironworkers will move quickly to finish the final steel structure. Congrats to the construction team and especially Ironworkers Local 7 for the amazing progress. With structural steel in place, space has been cleared on site to mobilize many other trades. Soon framers, masons, electricians, plumbers, glaziers and other trades will be swarming all corners of the site. More photos from the ceremony after the jump. The City of Boston and Charlesview have layers and layers of importance to one another. 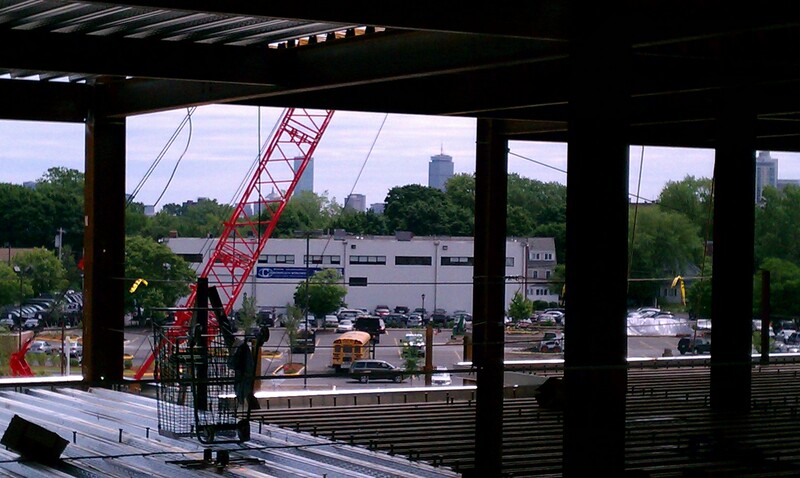 As the steel buildings rise along Western Avenue, downtown Boston comes into view. And with activity ramping up all over the site, there are now over 120 construction workers on the jobsite each day, priming the Boston economic recovery and great local jobs. We move closer and closer to realizing the vision of preserving Charlesview as a critical housing asset for Allston-Brighton families. Workers prepare the reinforcement for the concrete deck to be poured later this week. Progress continues inside the garage on mechanical and plumbing. Street wall coming into shape: Steel erection of Building E1 in progress, with the steel framing of Building D1 completed in the background. Close observers of the Charlesview construction site will notice two major shifts in construction activity this week. The first is the relocation of the steel erection crane to the eastern side of the garage deck. 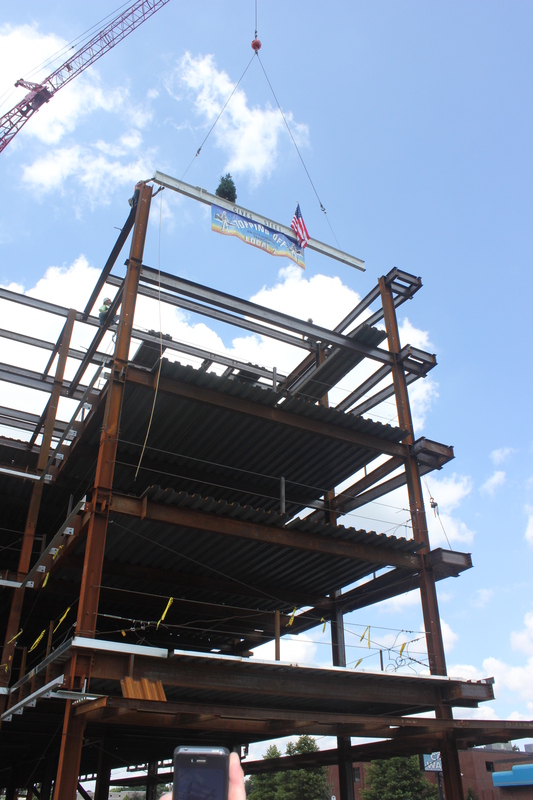 The last of the Building D1 structural steel was lifted into place and connected last week, so the crane is moving into place to erect building E1, the 84-unit building along Western Avenue with ground floor retail. As the largest building on the site, getting E1 under way is critical to keeping construction progress ahead of schedule. The second shift is activity on a new portion of the site, on the southern side between STAR Market and the former Brookline Machine shop. That area, known as “Block C” to the construction team, will be a residential block with five woodframe townhouse buildings containing 16 units. (The remainder of Block C will contain three buildings with homeownership units). Foundation work on the rental townhouses should begin this week, with wood framing coming later this summer, when the whole site will be bustling with activity.